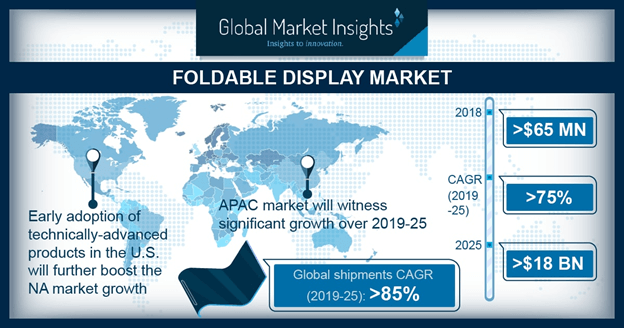 Foldable Display Market size is set to exceed USD 18 billion by 2025; according to a new research report by Global Market Insights, Inc. The global shipments are set to grow at a CAGR of over 85% between 2019 to 2025. Foldable display market size is anticipated to grow at an exponential rate owing to the increasing inclination of smartphone manufacturers to integrate this novel innovation into their product offerings. Companies are foreseeing the technology as the next big thing for key differentiation in their products. Many companies have filed patents for their devices that will enable them to stabilize the falling smartphone market and captivate the attention of tech-savvy consumers creating growth opportunities for the market. The key driver for the market is the growing support to this new technology from the industry players. Google is among the major supporters of the technology as it requires a compatible integration of hardware and software for foldable devices. The company is ensuring that there is a uniform API surface for the developers to support the future phones. Screen continuity, multi-resume, and multi-display are some of the software that Google is testing for this technology. The Android community has further extended support by modifying their applications that will be compatible with these advanced screens. In addition, Samsung and Apple are collaborating to optimize the UI experience for such devices. There are various technical solutions that need to be worked upon to provide unprecedented experience to consumers. The commercialization of smartphones set by Samsung and Royole Corporation in 2019 will further create enormous growth prospects for the market. There is an intense competition among companies to launch its device early in the industry. Huawei, Xiaomi, and Lenovo are working rigorously in eliminating the drawbacks from their device prototypes. With the companies launching their products in the future, the foldable display market will witness lucrative growth. The smartphones are the initial step for the technology; which is further expected to explore its potential in other markets such as notebooks, wearables, TVs, etc. The market will be fueled by the technical capabilities of companies to incorporate them in their products with different designs, confirming their practicality and usefulness. Major manufacturers in the market space are Samsung, BOI, Innolux, LG, Royole Corporation, among others. The industry is consolidated, and the players have been focusing on developing technologically-advanced products by investing in R&D. In October 2018, Royole Corporation launched its smartphone/tablet device in the market named FlexPai, which is available for developers at a price of over USD 1,300. Companies are also collaborating with smartphone manufacturers to commercialize their devices. For instance, BOE has collaborated with Huawei and other three companies in the market. Huawei is expected to launch its device in 2019.